» Which Marketer Type Do YOU Fit In? Most smart beginners looking to the Internet to earn an income start by first looking for someone prominent in the industry that they can trust to hopefully learn the basic process that needs to be in place to earn that so desired income. The only problem with that depends on the marketer they eventually follow, they may be learning habits that will get them less than desired results. There are 4 categories of marketers to be identified. Which one do you fall into? 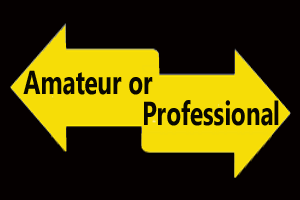 The Amateur: The first category is the amateur. That marketer will bring traffic to an offer, either free , pay per click or some other form of paid traffic. They also will use traffic methods that can either leave them broke or banned. The biggest drawback is that this marketer is usually building someone else’s list since being new to the marketing game, they have had to promote someone else’s product rather than one of their own. The Typical Marketer: The typical marketer brings traffic to a custom optin or landing page emphasizing the fact that living without this product will make ones life miserable. An offer to sign up and learn more about it before buying will get some prospects to exchange their contact information and the marketer will finally be building a list. For this to work, the prospect must really WANT to know more about that specific product before giving up their contact info just for more information about it. This approach will most often earn the typical marketer less than $100 per month. Lack of sales will often lead to this marketer quitting the marketing game. The Pro Marketer: Very much like the typical marketer, the pro will drive traffic to a custom landing page, create a lead magnet to exchange for the prospect’s contact info but unlike the typical marketer, the landing page will NOT promote the product. Instead, a free give away of good value is dangled as bait in exchange for the prospect’s contact information. Then as a relationship is built with the prospect over time and trust grows, the prospect is more likely to buy. This type of marketer can make a good living online and many are doing it. I am. The Regenerative Marketer: This marketer, the same as the pro will have a similar sales funnel in place but with one big difference. The offer will have regenerative value as it will be able to be constantly improved, relaunched, improved again, relaunched, you get the picture. What makes this offer so good has all to do with the niche one is in and the demand. It’s not a one time hit wonder that will fail down the road. This is the marketer that you hear who makes those big dollars year after year and what everyone is after. But it comes at a cost. So which category do you want to be in? Don’t forget that to fit in the last category, one has to be ready to go that extra mile. It takes dedication, perseverance and a monetary investment few are prepared to make. It also demands a dynamic team working for the same goals. And it’ just NOT for everyone. If you find yourself stuck in a marketing category that is giving you NO RESULTS, then you should consider mentoring with me. I have the experience to take you to the next level.